Click on the clipboard image to the left to activate the return on investment calculator. FormsCreator is fully integrated into Solution-IV Accounting and supports multiple, simultaneous output formats; this means you can print a laser copy at the same time as e-mailing or faxing a copy to the customer. Each Solution-IV customer and vendor record contains the default output methods for each form (laser print, fax or e-mail) along with customer or vendor fax number and e-mail address. Then when a form is printed in the application, FormsCreator automatically routes the form as you have specified - either to your printer, fax, or email or a combination of the three. The default printer, fax number and email address can also be changed on-the-fly, if desired. 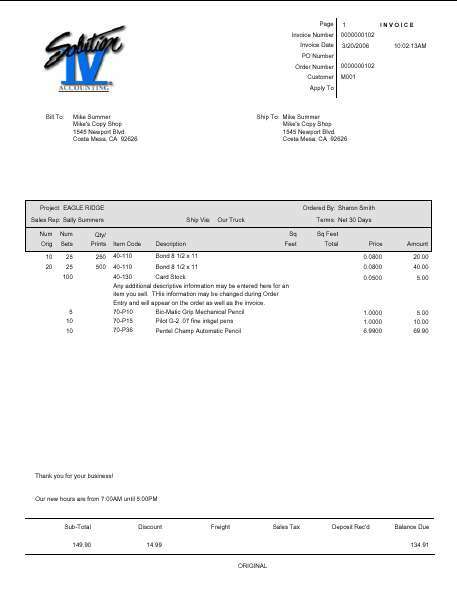 This is useful if there are many different contacts at the recipient's location..
VSI*FAX by Esker is used to support the fax requirements of FormsCreator that the customer may purchase, or Thoroughbred offers a Fax Service for low per-copy pricing. . In addition to printing, faxing and e-mailing your forms, you can set up your forms for archival on your file server. This can be useful for maintaining a permanent electronic pdf copy of any forms you desire to archive - invoices, orders, statements, purchase orders or other documents. FormsCreator provides for multiple, copies of each form in your system. For example, if you need three copies of your invoices, but only one copy of your other forms, you can set up your invoices to print three copies - Original, Customer Copy, File Copy - with the copy name appearing on each invoice. 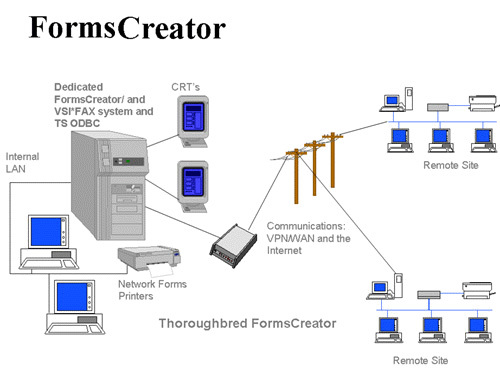 FormsCreator forms are designed using the industry leading Crystal Reports and may be modified by either Thoroughbred Software Consulting Services or by you. The Crystal Reports runtime engine is included with FormsCreator. 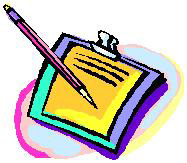 However, if you want to modify the forms yourself, you will need Crystal Reports Professional or Developer versions. From Diana at Lane Office: Our experience of switching to FormsCreator has been seemingly effortless. A few quirks were easily worked out with the Thoroughbred team and being able to create .pdf files and e-mailing them without getting up from a workstation is such a time saver. It's probably the best thing to happen to our application in the past ten years. We are very happy with FormsCreator. From Mary Ann at Business Interiors NW: We are extremely pleased with FormsCreator. The form design portion was relatively easy -- we worked very closely with Thoroughbred to get "just the right" spacing and look. Our users are extremely pleased with the finished product. It has a crisper, more professional look. Also, when we use the .pdf function to e-mail or print our forms to the color printer, we get our logo showing with color. How does FormsCreator work? When a form is printed in Solution-IV or your application, FormsCreator takes this print request and merges the application data into the Crystal Reports developed form using TS ODBC DataServer™ and the Crystal Reports API. The merged form is then automatically routed to the appropriate printer, e-mail address or fax number. When the system is set up, form definitions are established as to which forms to print using FormsCreator, the number of copies and form names for each form and the default printer to use for each operator printing forms. Once the set-up is accomplished, the forms are processed transparently via standard application operating procedures. Because FormsCreator utilizes the Crystal Reports API for printing forms, FormsCreator must run on Windows based computer system. This system should be running Windows 2008 or 2012, or Windows XP, Vista or Windows 7/8, and should have at least a Pentium-IV processor with at least 1 GB RAM. Also, all forms printers must be addressable as network printers from this Windows FormsCreator Server. If you are printing forms in multiple locations, all printers in the remote locations must also be addressable by the server via VPN or other similar connectivity. Included in the FormsCreator library is the FormsCreator application, the Solution-IV forms library, and two (2) seats of TS ODBC Read/Write DataServer (2 are required for each physical location). Additional TS ODBC DataServer seats may be needed to support additional locations. A VPN is recommended for a multi-location installation.